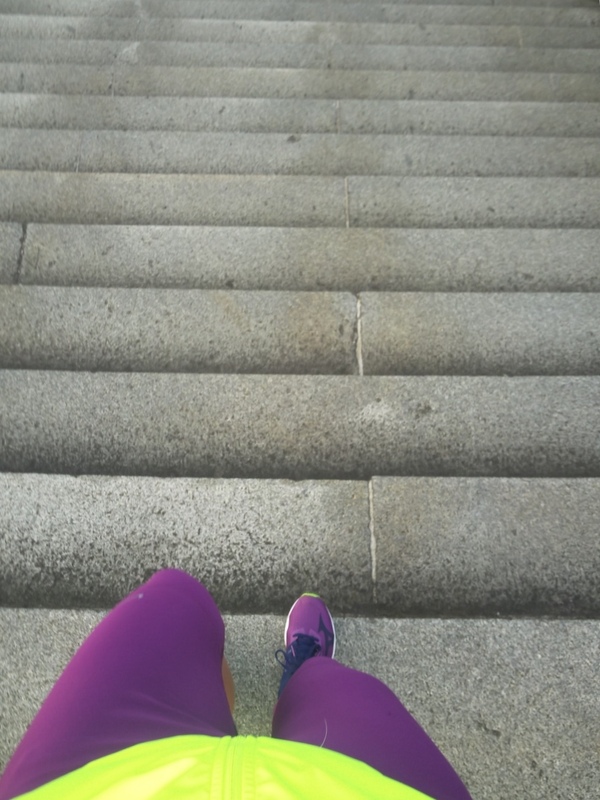 Thursday’s stair and burpee run was good, but it left my calves right until a long easy run on Sunday and some foam rolling. 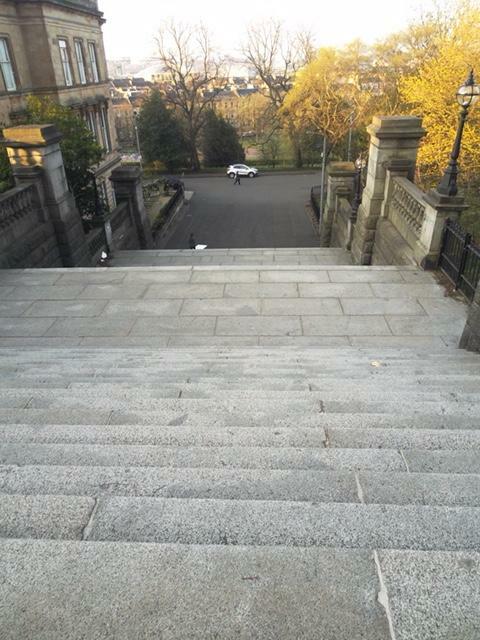 It was pyramids of the stairs (900 stairs in total) and 45 burpees in total between the pyramids. Brutal, but clearly good at the same time. Hopefully it’ll be easier with faster recovery next time. I was going to do a 10k time trial on Sunday (today), but instead ran 10 easy miles including just over 4 miles with my friend Debbie. I’ll aim to do the 10k time trial along the Clyde on Tuesday morning instead. 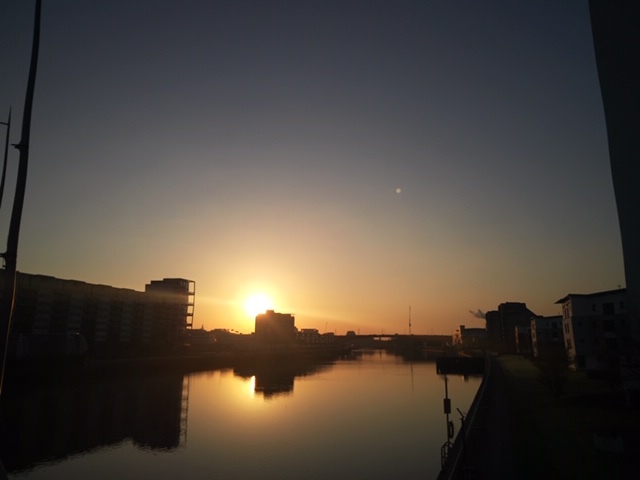 It was a nice morning for it, sunny and cold but good running weather. Next week my shift at work will change a bit next week and I’ll be working 11-7 Monday Tuesday Wednesday so I’ll try to get a bit of a lie in and train at about 8am those days. Then I’m off work the Monday Tuesday after so I’ll see what we’ll get up to then. I might have mentioned last week that I’ve been increasing the amount of protein in eating, and being careful not to be greedy. 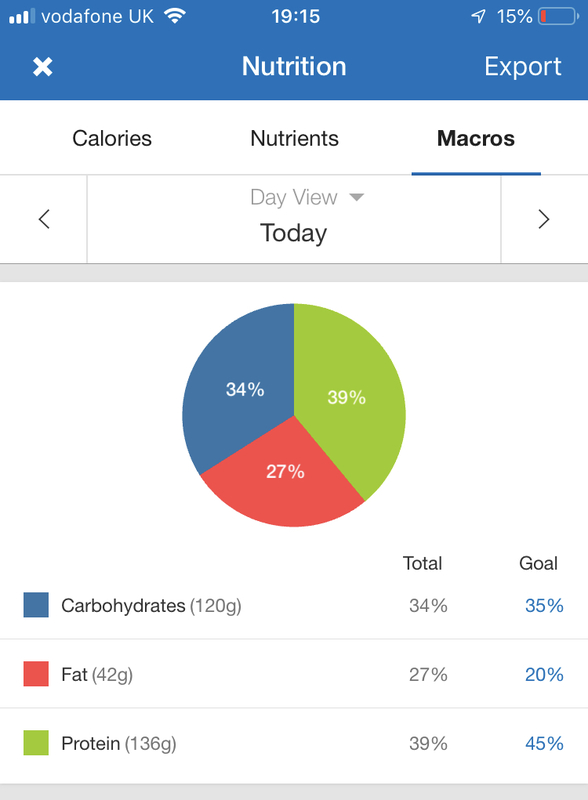 About a third of my calories are protein, and I’m about 1200 calories under my calorie goal for the second week in a row. That’s resulted in a loss of 2lbs overall, with a reduction of 2.8lbs body fat. 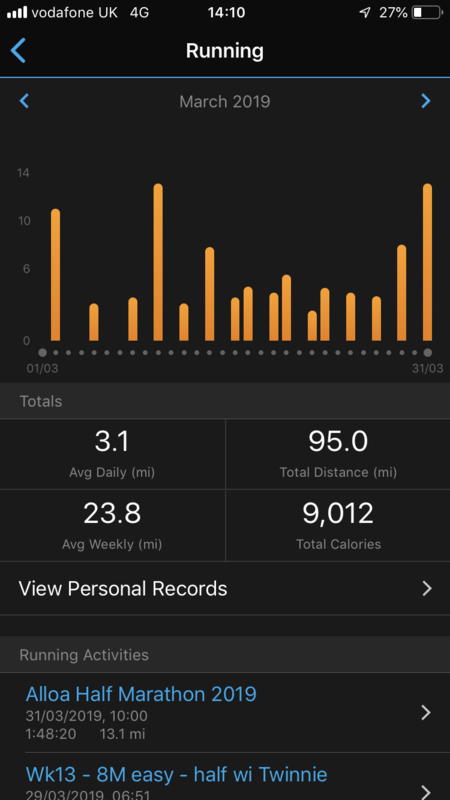 I’ve run about 18 miles each week, and done three strength sessions. My sleep could be better, but work is in a little bit of a flux state just now, so I can’t see my sleep improving much until I get a holiday again (5 weeks and counting). I’ll maybe get longer sleeps with three days of later start coming up. – my protein powders mixed with fage total 0% Greek yoghurt and berries for a snack. – the Greek yoghurt above added to my breakfast cereal (and sometimes vanilla protein powder mixed in with it). – apples for snacks instead of snack sized mars bars (not protein, but less cals). – beef n black bean sauce for chinese takeaway, with uncle bend wholemeal rice instead of takeaway rice. 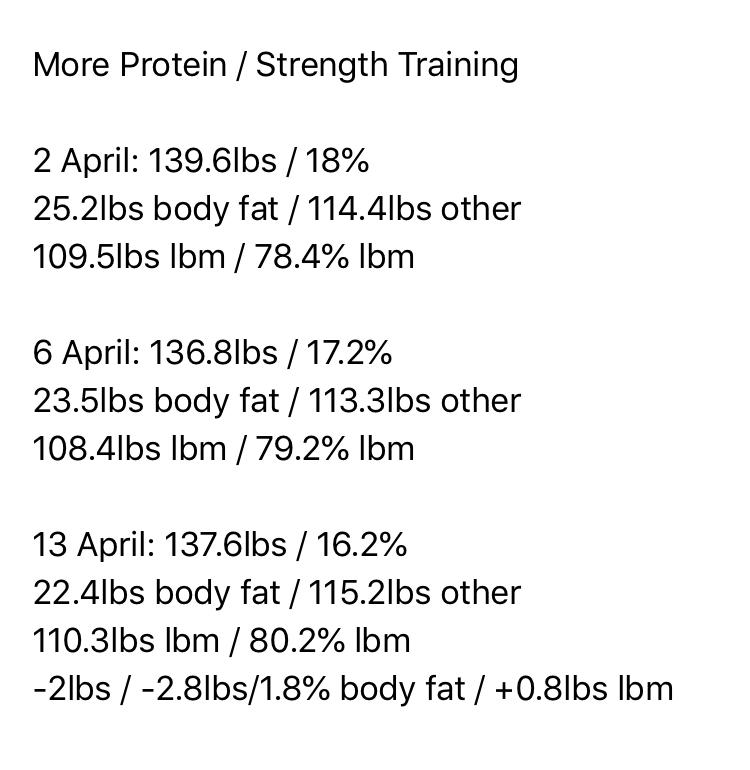 Another good week of training and nutrition in the diary and the numbers are going the right way anyway. 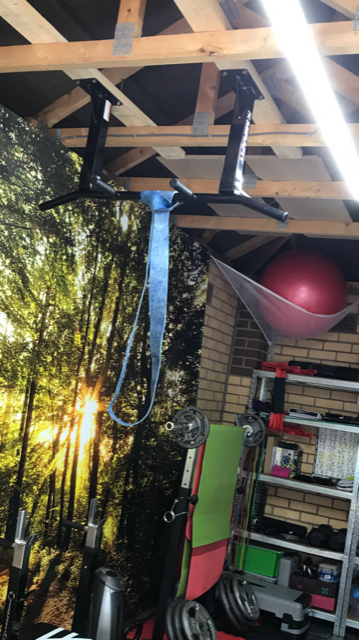 A pull up bar with resistance band to help me do pull ups. It’s secured tightly to 32mm wood, which is secured to the rafters. It’s from mirafit and I ordered it from amazon to avoid paying delivery. It has the side bars, two wide bars on one side, and two bars closer together on the other side. I’ll try to do a few sets of pull ups each workout and see if I can progress them each time. Wish me luck! Here’s what I did in this morning’s workout. 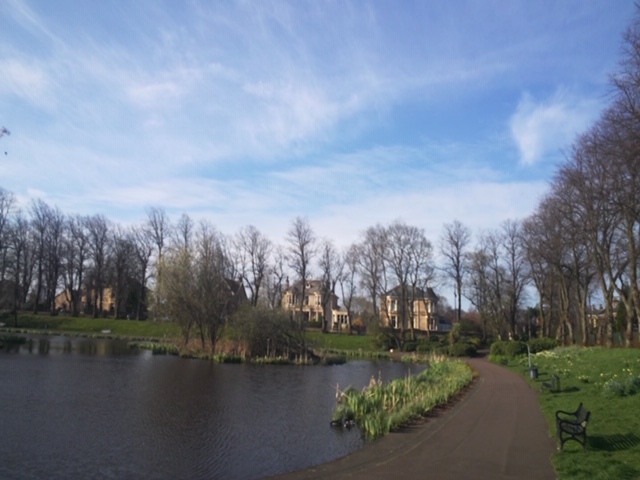 I ran over the Clyde to Kelvingrove Park and did the following run / workout before work. Up the 1st set of 20 steps, back down. Up the 1st and 2nd set of 40 steps, back down. Up the 1st, 2nd and 3rd set of 60 steps, back down, then burpees. And in reverse. All times three. Then a finisher of 3 times all the way up to the top and back down. 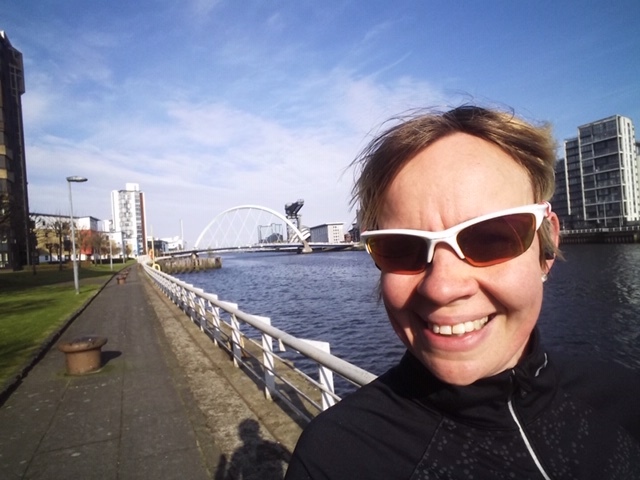 I was bit of a mess at the end, legs shaking, feeling a little sick.. (but still able to smile for the camera and get photobombed by a commuter) … but I do like a wee pyramid. Ooft!! All in all it took 40 minutes including 26 mins warm up and cool down jogs, and 24 mins of stairs and burpees. Boak. It must be good for you. Here’s the workouts I’ll do in April and May. 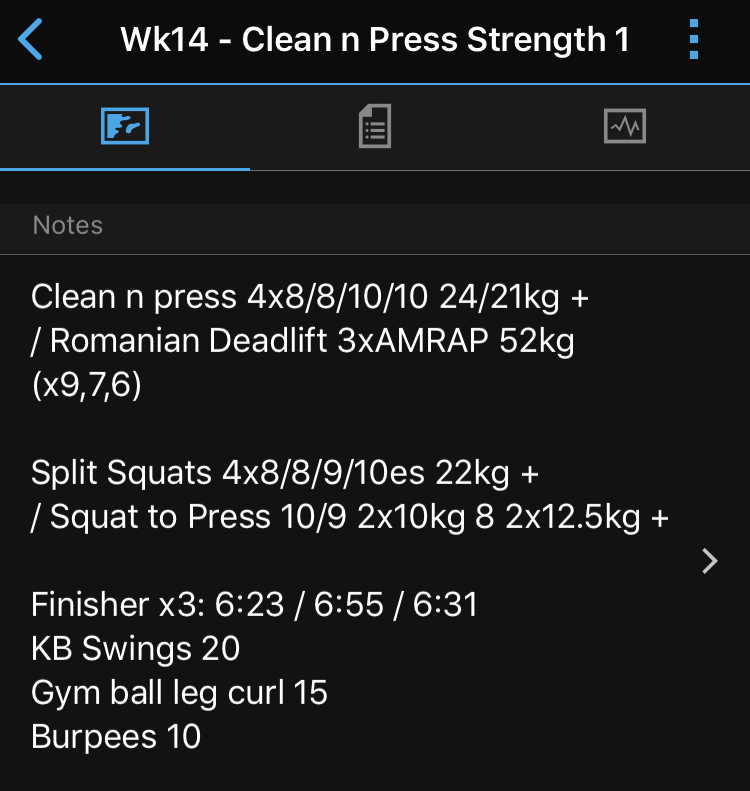 Aiming for three strength workouts a week, but some weeks I’ll do two when other things get in the way (like last week, where rest was required on Monday). 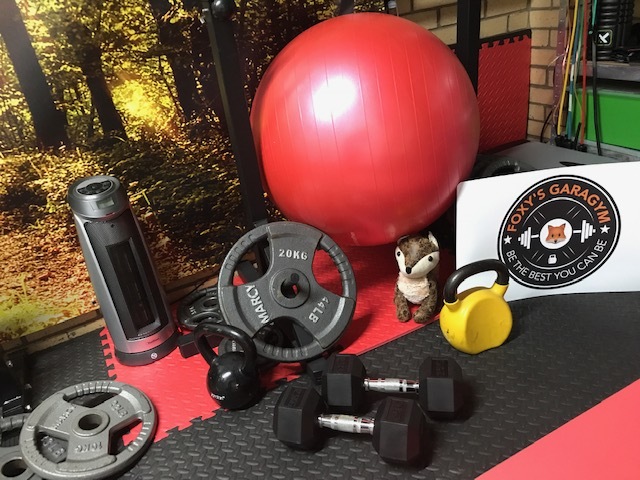 I’ll aim to do do strength training on Monday, Wednesday and Friday, and I’ll aim to run on Tuesday, Thursday and one day at the weekend. I’ll do Bike HIIT after the workouts, 8×20:10s, with a warm up and cool down, totalling around 8 minutes. I’ll take a my protein pre workout in fruit punch flavour before the workout, and think about eating more protein each day to help recover and fill me up. It’s a potent little concoction and turns pink when mixed. Ooft!! 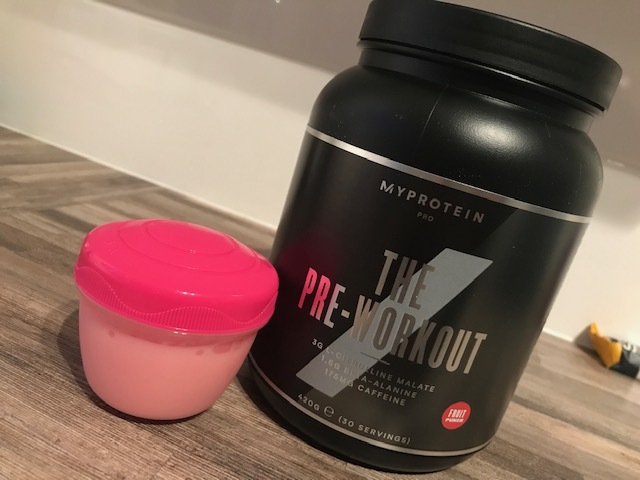 Here’s the link to it… https://www.myprotein.com/sports-nutrition/the-pre-workout/11351672.html?variation=11351676 (check out the nutritional information on that page). Let’s see what all that does for me in April and May. 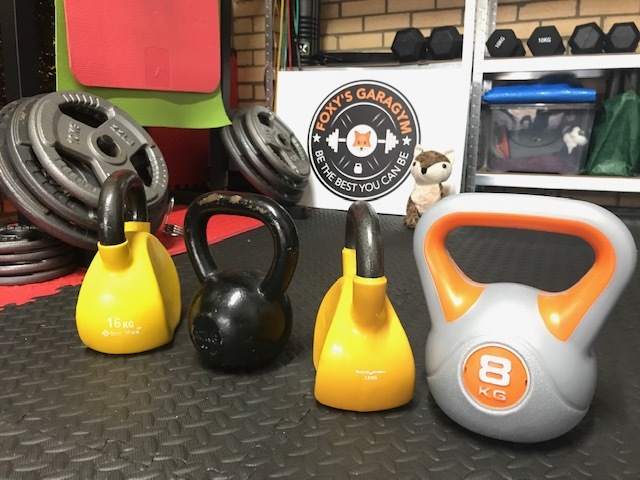 I’ve been using my kettlebell in my finisher workouts, and I decided today that I would add to my collection. 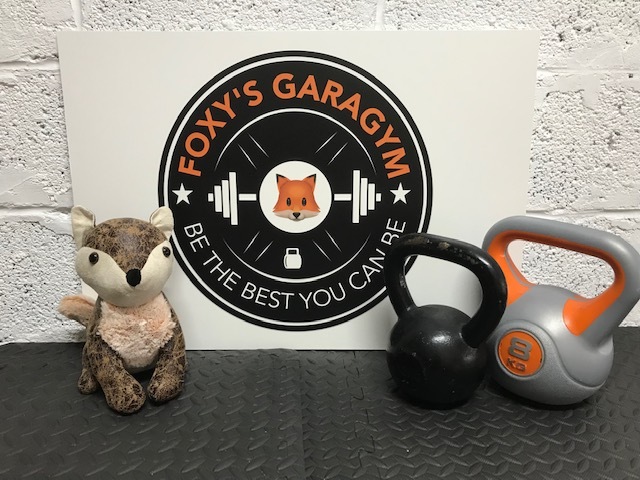 I have a shaped yellow 16kg kettlebell (which I use mostly for Swings), a black 12kg kettlebell, a shaped yellow 12kg kettlebell (which is actually 11.5kg) and a wee plastic 8kg kettlebell. I’ve ordered quite a few bits and pieces from we r sports (on Amazon). 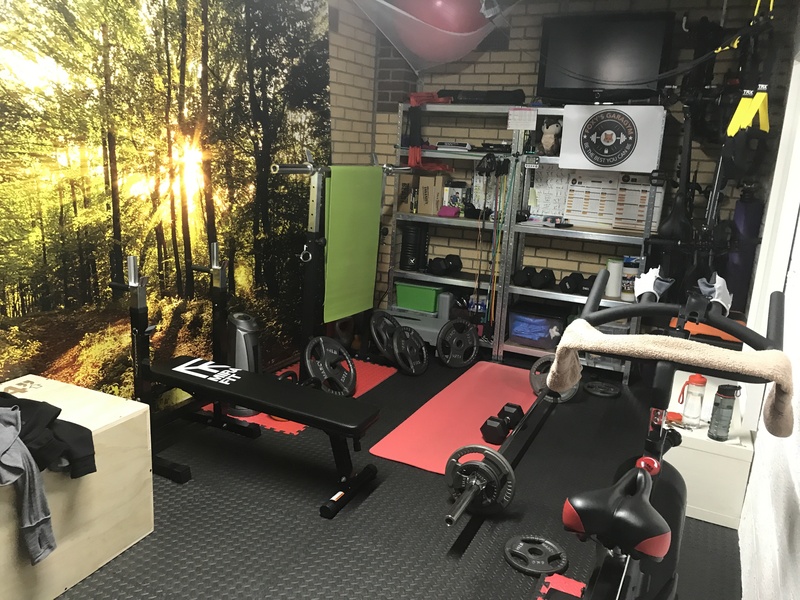 They’re always fast to deliver and have quality stock – I’d highly recommend them. 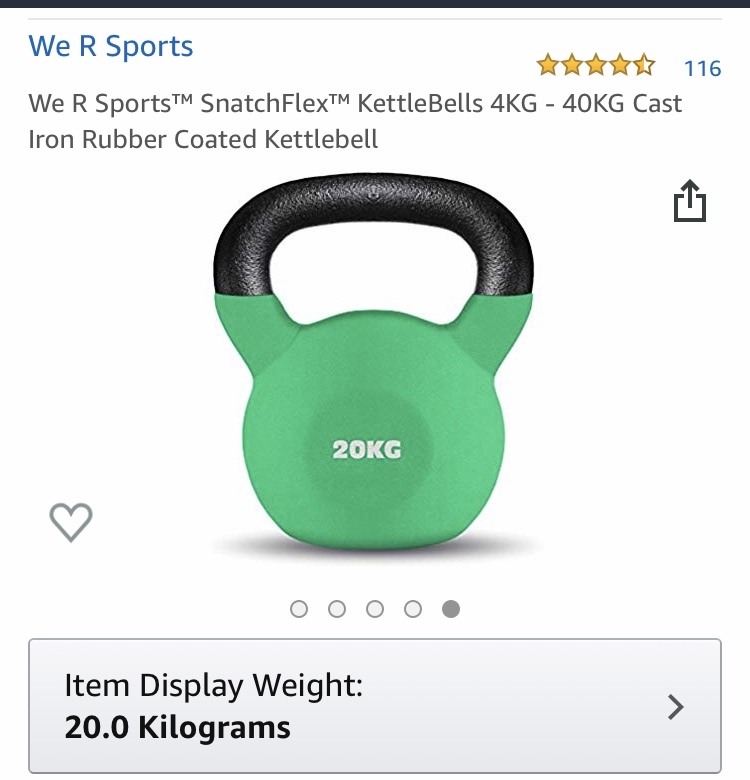 I ordered a green 20kg kettlebell from them today. 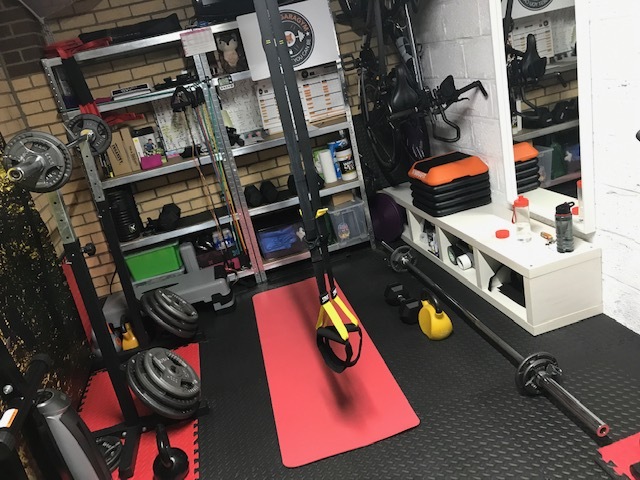 It should be good for my next progression for the kettlebell Swings and other exercises (and it’ll go with my green exercise mat too). Last week was another good week training wise. I took a needed day of rest on Monday and a day off work. 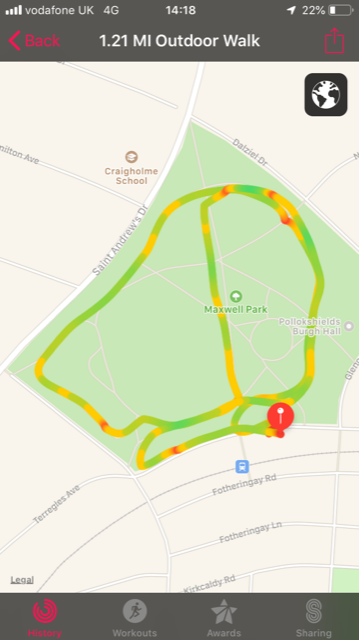 We had a wee lie in and went out for brunch, then a nice walk in Maxwell Park – easy active recovery. 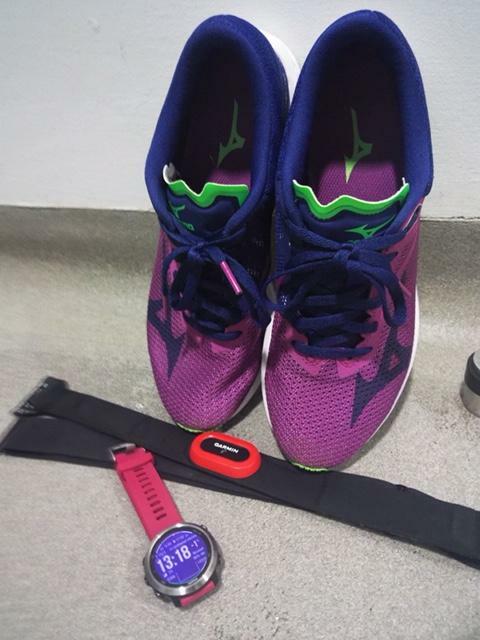 I’d run at nearly two hours with my heart rate at 162 on average / about 90% of my max. And on Monday I was feeling tired with a few sore muscles. A wee rest day on Monday and an easy 5k on Tuesday and by Wednesday I was feeling recovered. 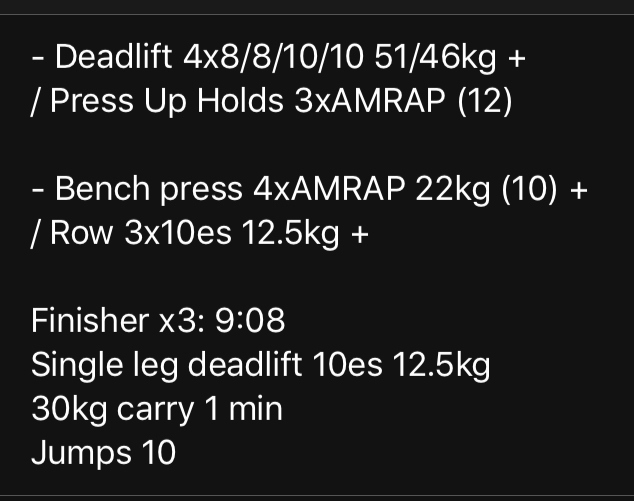 I did a good deadlift session on Wednesday… where I felt strong, but I’d not managed it in the morning, so did it when I got in from work. 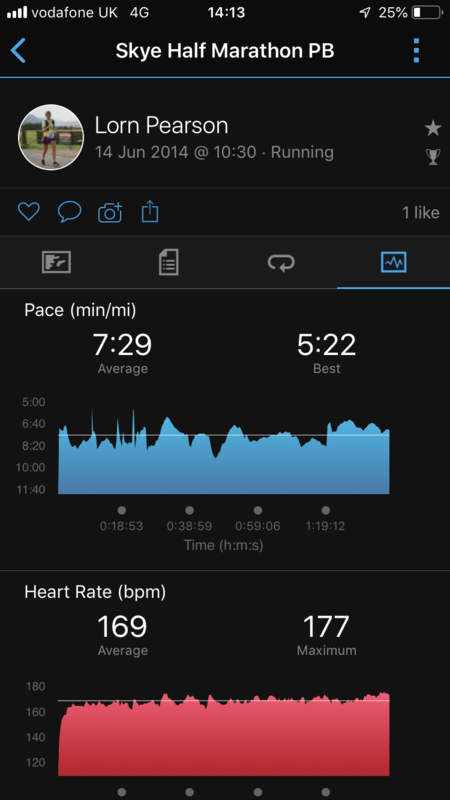 And then I was up early on Thursday to do a speed work type run / distance trial – see how far I could run in 35 mins with effort intervals. 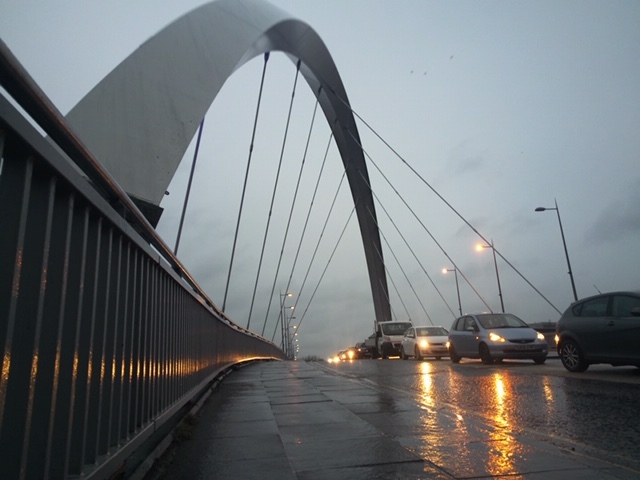 I didn’t want to push it too much, but got 4.04 miles along the Clyde and into Glasgow green. One to better next time, see if I can run further than that in intervals for 35 mins. 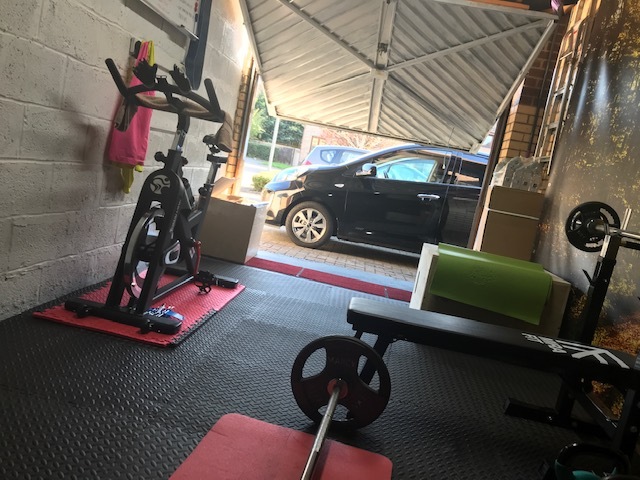 Friday was clean n Press Strength in the Garagym. I took a pre workout booster and felt great throughout and in the finisher too. Even did all my burpees without complaining much. My legs feel a little tender today (Saturday) but I’m having a rest day ahead of 12 miles coaching tomorrow so all should be fine. Strength & HIIT on mon wed fri and runs on the days in between. Should be fine. One thing I’ve changed since I got back from holiday is that I’ve aimed to: 1. Eat more protein (aim for 30-40%). 2. 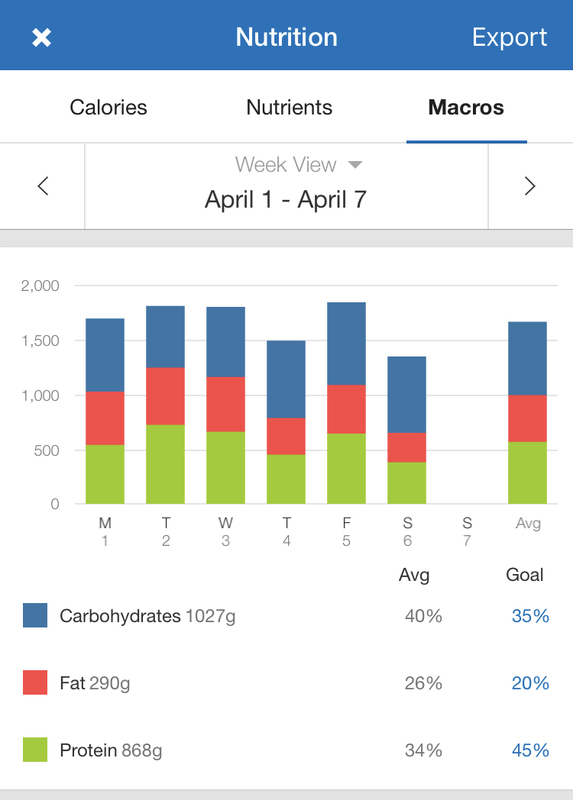 Track my food on myfitnesspal for the week. 3. Keep within a daily calorie goal. 4. Train as planned, Strength and running. Just to see what the outcome is. 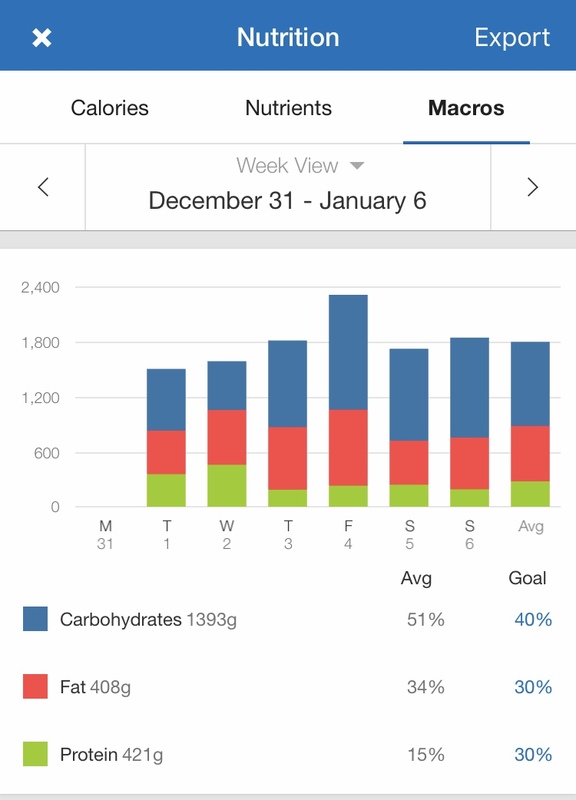 I tracked my food in January and the difference this week is quite stark … almost 35% protein compared to 15% in January. All I’ve really done is think about eating things with more protein in it, drink plenty water, and not eat everything in sight. I’ve been full most days, and even managed to pick a sort of high protein lunch out on Saturday (beans in toast). Chinese on Friday night, beef n green pepper and black bean sauce – pretty high in protein and tasty. With uncle bens wholemeal rice instead of from the takeaway. Simple swaps to make it a bit more healthy. And no snacking on chocolate. I’ve also not had any liquid calories this week – just water or black coffee. I’ve felt a few hunger pangs in the last week, but then eaten something high in protein which has kept me full. 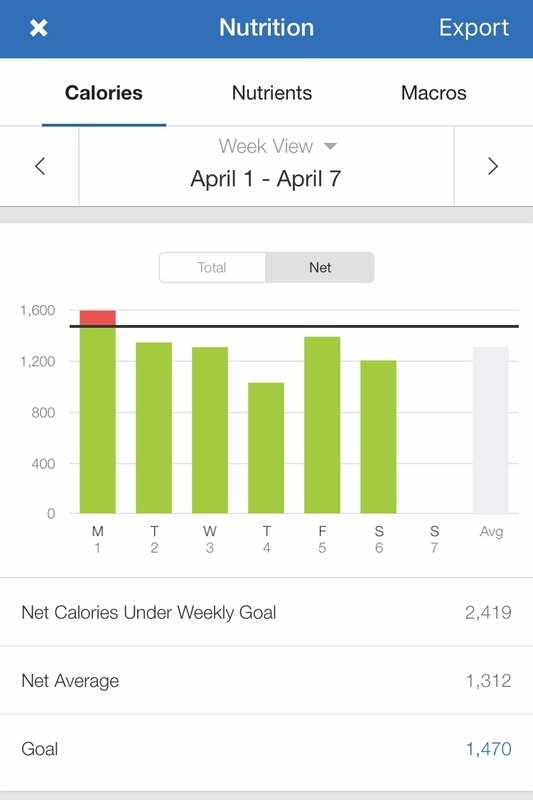 Under calorie goal for the week, due to the amount of activity I’ve done, including walking. About 150 cals a day under goal, will be about a thousand under goal by the end of the week. (I ate more on Monday to help replace the day / half marathon before). And the result is … a drop of 1.6lbs in weight. .. that’s -1.4lbs body fat and -0.2lbs in other. 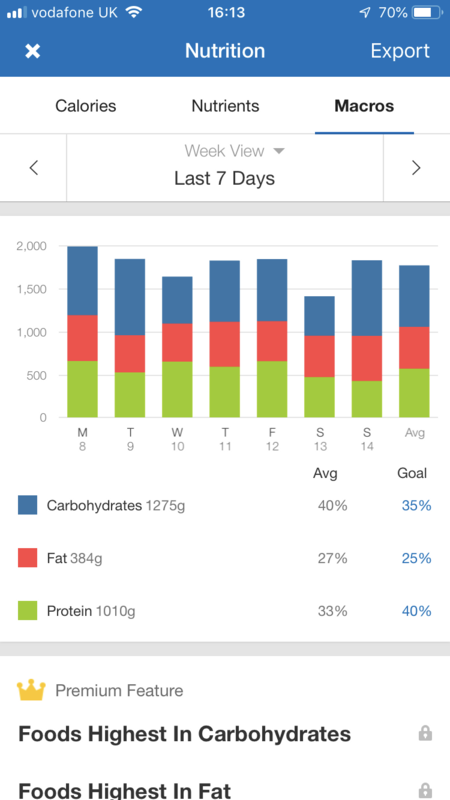 Now I’ll not be tracking my food, but I’ll try to eat similarly to how I ate this week, and remember not to be greedy. Going in the right direction anyway, in just a week of doing well with training and nutrition. A long run tomorrow, coaching, will be 12 miles with Tania. She’ll have run 6 easy miles by the time she gets to me, then it’ll probably be her last long run before the London marathon. Her training has gone very well, so I’m sure she’ll smash it at the end of April. 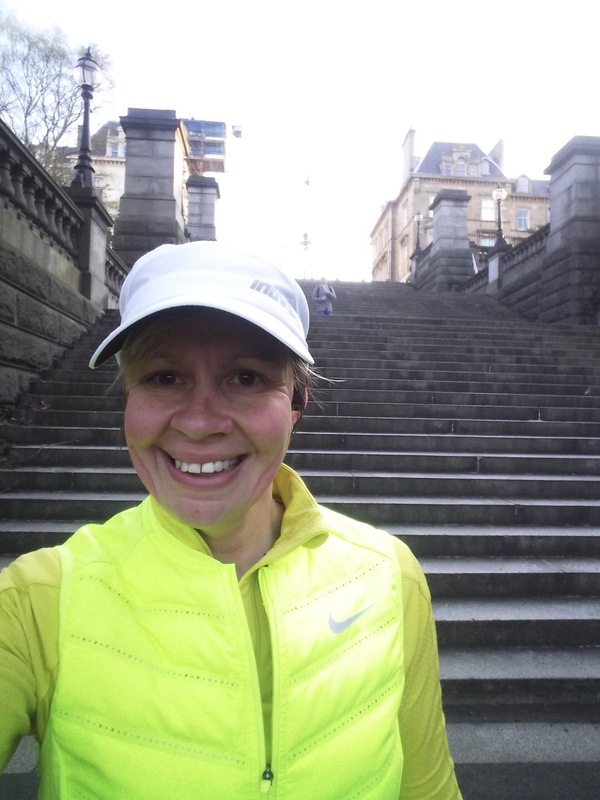 I’m planning hills in Kelvingrove hopefully on Thursday and a wee run on Monday night and Tuesday lunchtime. Then maybe a 10k time trial on Saturday, and my three Strength session. It was a bit dreary on Thursday this week when I ran in the morning, but hopefully the weather will improve in the coming weeks. Last week was a good balance of training and rest for me. 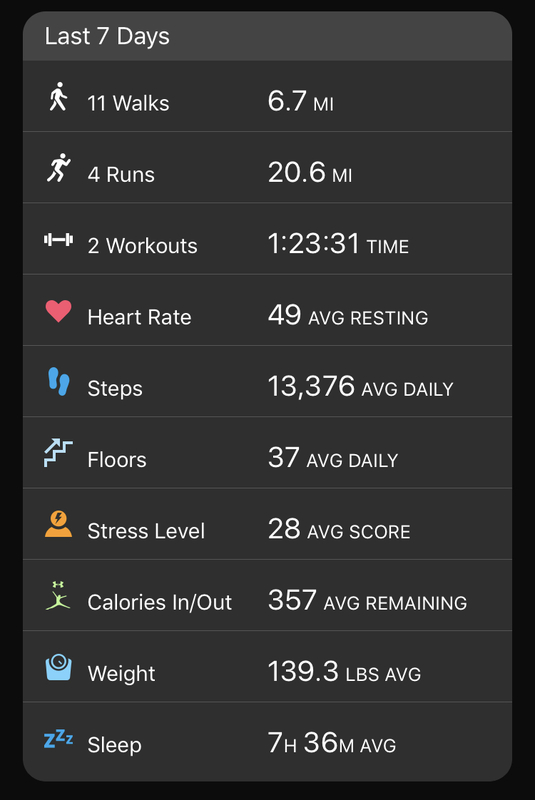 Although I only did one strength session (on holiday) I did a good amount of running – nice and easy apart from the half marathon yesterday. That’s a jump up to 95 miles running for March, and I managed a good solid two weeks of three strength workouts too. (Jan was 70 miles, Feb 75 miles with limited strength training). And it was a higher than normal 16 runs in the month, even with a week of holiday. 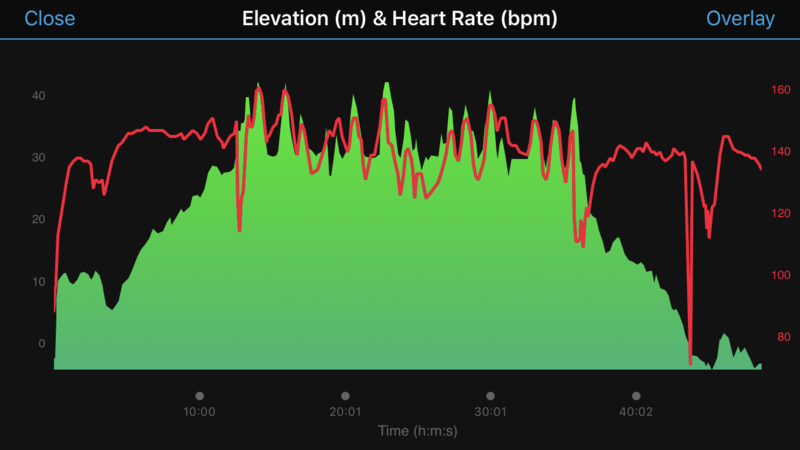 My Garmin seems to be giving me positive feedback – saying I was peaking ahead of the race, and now training productively, with an increase in my vo2 max estimate to 52 the other day, and 51 today, which I’ll take. 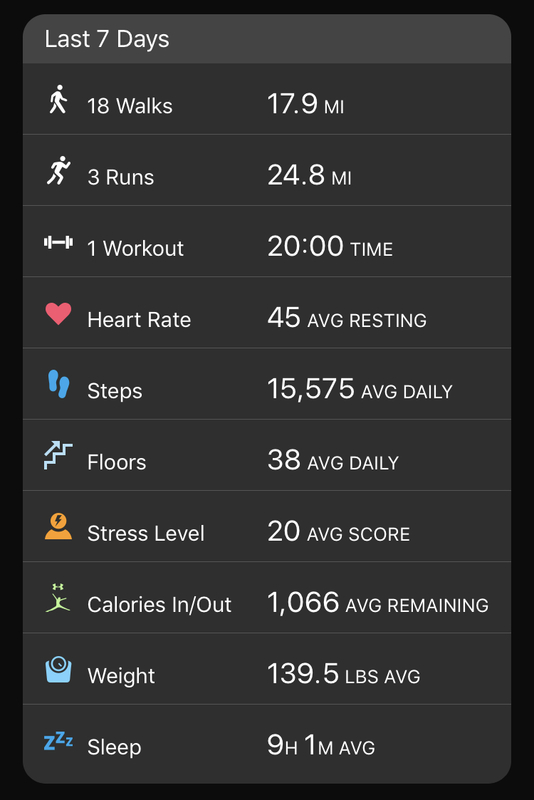 For the Alloa Half on Sunday I knew that I’d push myself, and with my average heart rate at 162 / max 178, for nearly an hour and 50 yesterday, I’m feeling it today. 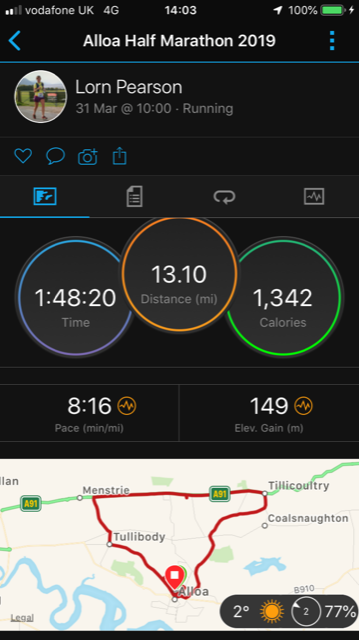 It was about 10 minutes slower than my overall pb at Skye half marathon 5 years ago – when I pushed my average HR 7 beats higher (169 on average!! )… for (probably a once in a lifetime) average pace of 7:29. 5 years older, and 11lbs heavier… go figure. 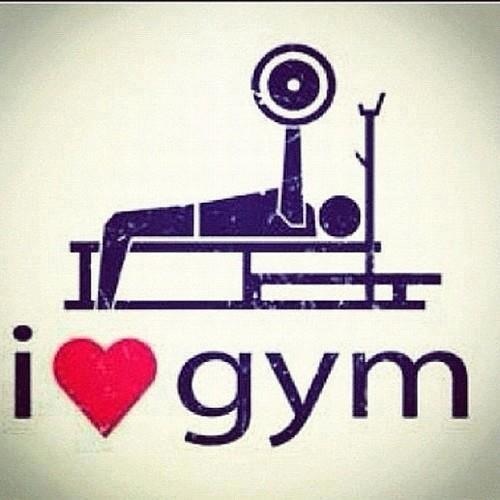 (Getting old-er / carrying more weight = adds 10 minutes on lol). About 45 seconds a mile slower at Alloa yesterday, but I’m good with that. 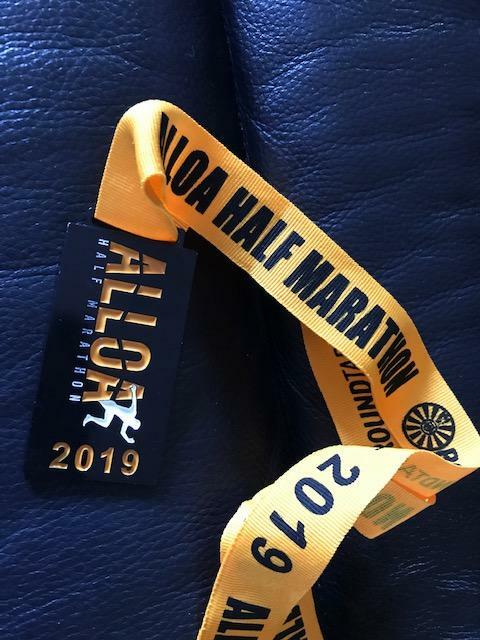 After the race, I stretched after an did my usual recovery, walked some and ate and drank plenty, but I do feel worse than I did after the Inverness half marathon where I appeared to work a wee bit harder than yesterday. 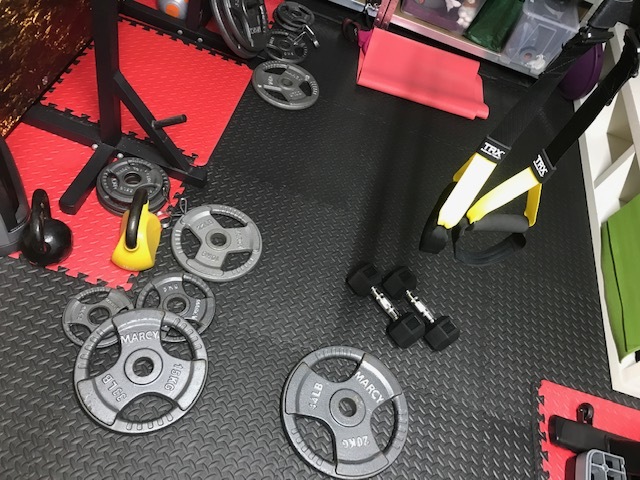 Let’s see what’s sore today … my toes, the sole of my right foot, right ankle, my calves, hamstrings and quads, my obliques, my mid and upper back, shoulders, left side and back of my neck. Lol. And my eyes have a bit of blurry vision too (tiredness). And that’s after a good 10 hour sleep last night and 400mg of ibuprofen this morning. Proper race hungover… but it kinda feels good, so I’m not complaining. Rest day today, that’s for sure… and I’ve already had two small breakfasts and two coffees (after I woke up with the runger) – then a week walk around the park for some light active recovery. And now that I’ve entered the Troon 10k on the 9th June, here’s my idea of what a 10 week training plan for it will look like. I might do easy runs instead of the speedwork midweek, but we’ll see. And there will likely be some coaching in there too replacing some planned runs. 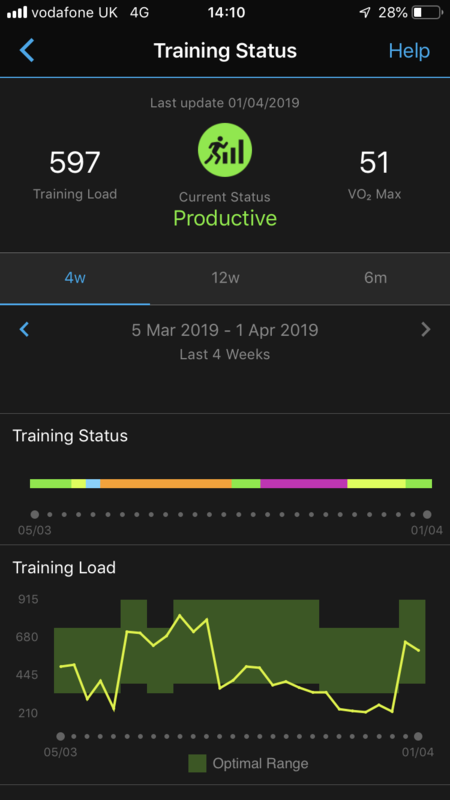 The main focus will be on fitting in 2-3 good strength sessions a week in April and May, and doing my running around it. Oh and I’ve started painting the inside of the Garagym door white. One coat down, it’ll be a lot brighter once it’s done. And for once in my life I’m looking at what I eat a bit more, less greediness / eating what I want because I’ve earned it running, more being conscious of what I’m consuming to fuel my training well. Play about with what I’m eating when and see if I can make an effort to eat more protein. We’ll see how that turns out. I’ll have a few things changing at work in the next few months, so I’ll be trying to roll with that and keep everything ticking along nicely. Roll on Spring / Summer. 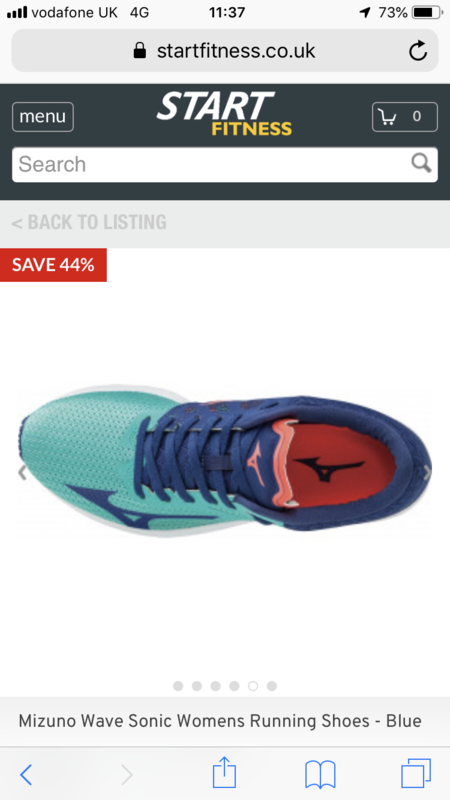 Oh and finally, as a reward for doing the half marathon I decided to treat myself to a new pair of trainers… another pair of my newly found Mizuno Sonics… in light blue instead of purple this time. 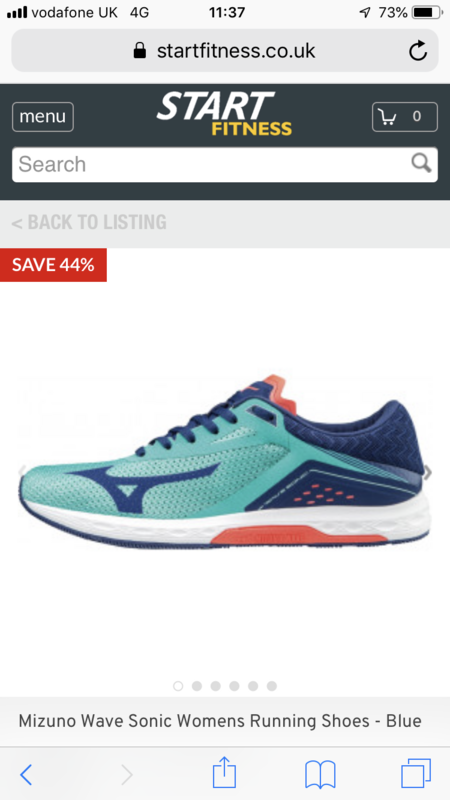 Lighter and less supportive / structured than my usual mizuno wave inspires, these are described as racing flats which can go up to 26.2 miles. And come at a pretty reasonable price.